With a toddler, just one income, and no chances of becoming paid screenwriters anytime soon, we’re on a very tight food budget. Eating well on a budget can be tough, but I’m here to tell you it is more than possible. Most Sundays we head out to the Hollywood Farmers Market on Ivar and spend whatever cash we’ve got on fresh produce. Weeks of bounty also see a visit to the bison meat lady. The celery was only $1 a bunch so I bought three. It’s one of my husband’s favorite snacks to bring to work. The carrots and cucumber were $2 total. The zucchinis were $1 for all three. The apples (there are six of them) were a bit under $5. I suppose they’re a bit of a splurge but they’re the best apples I’ve ever eaten. The onions and garlic came to around $2.50. I bought the sweet potatoes last, my son twisting himself around my shoulder and reaching for them (he was on my back in an Ergo carrier). I picked those four up and handed them to the vendor, explaining that I was down to $2.30 and would take however many sweet potatoes that got me. The scale said $2.86 but he gave them all to me. Read more about The $20 Project here. I’m guessing with the numbers you’re talking, these can’t possibly be organic. Are those Fuji apples, or Braeburns? I’m getting tired of the same old six varieties at every market. Does the farmers market have some more exotic varieties? 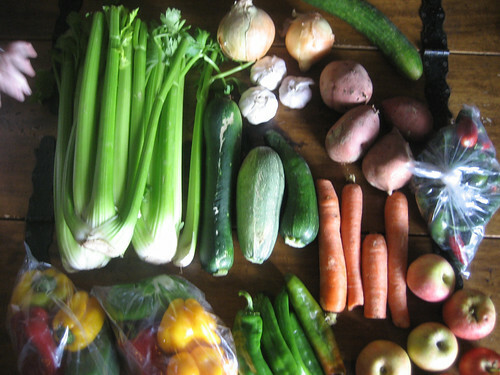 Mmm….vegies are my favorite bounty in LA and Cal in general. Growing up in the midwest we had only a few months of local fresh produce. After that what we got was beat to death on trucks before it made it to us, or canned. You scored, and nicely on that vegie round up. Everything shown is organic. The peppers were all seconds, which seems to mean that one or two of them have slightly wrinkly skin. The apples are a mix of Fuji and Gala. I’ve seen several other varieties, but tend to stick to these. I’m a creature of habit. I’ve been enjoying Honeygolds lately. Found at Whole Foods. Get thee to Food4Less. And remember: It’s so cheap because you have to bag your own groceries. Don’t just stand there wondering what’s going on! Previous PostPrevious Wolfpack Hustle – All City Century Tonight!